Stuck In Traffic? You're Not Alone. New Data Show American Commute Times Are Longer Newly released data from the U.S. Census Bureau show Americans have spent an extra two and a half hours commuting last year compared to the year before. The average American commute increased to 26.9 minutes in 2017 from 26.6 minutes the year before, according to new data from the U.S. Census Bureau's American Community Survey. That 18-second increase may seem small, but it totals an extra two and a half hours on the road for Americans last year, according to the Washington Post. Total commute time has been steadily rising, with more than 14 million people now spending an hour or more traveling to work in 2017. "The longest average travel times are generally associated with large metropolitan areas," Brian McKenzie, Chief of the Journey to Work and Migration Statistics Branch of the U.S. Census Bureau says. McKenzie says the East Stroudsburg, Pa. metro area has among the longest average one-way travel time, clocking in at about 37.9 minutes. The U.S. Census Bureau contacted NPR with new information to include the New York-Newark-Jersey City metro area, which has a travel time of 37 minutes. Travel times for the two metro areas are not statistically different from one another. Among the shortest average travel times, usually less than 20 minutes, were in Cheyenne, Wyo. and Grand Forks, N.D.
Sam Schwartz, who popularized the term 'gridlock,' is not surprised that commute times are ticking up. 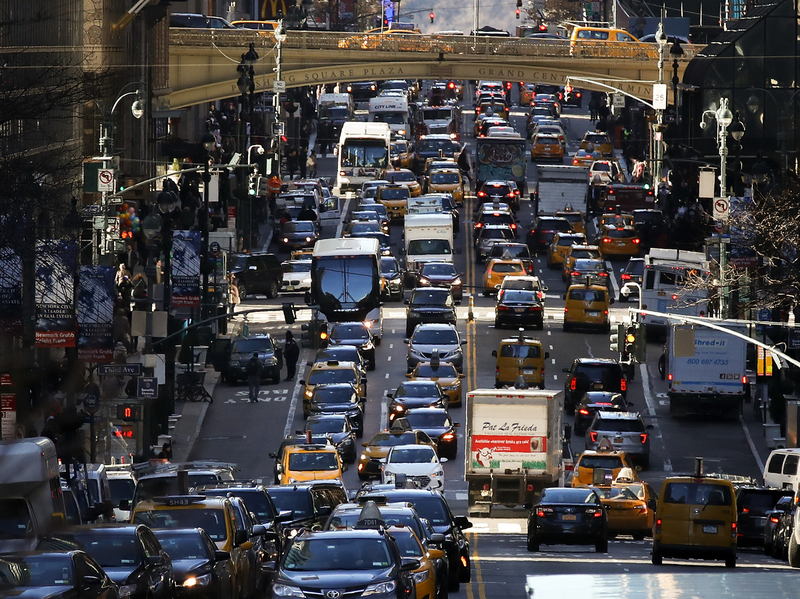 Schwartz, a former New York City traffic commissioner, told Here & Now's Jeremy Hobson that population growth and the booming job market means more vehicle miles traveled. "When vehicle miles traveled goes up — especially in dense areas — travel times go up with it," Schwartz says. App based services like Uber, Lyft and Via also contribute to time spent in traffic because they are often in motion dropping off and picking up passengers. These vehicles have a greater impact than a car that is parked in a lot or garage and doesn't move during the course of a day. Cities are getting more congested. Schwartz uses New York as an example. "Speeds over the five or six years that Uber and others have been in existence have dropped from a very slow 6.5 mph to 4.7 mph," Schwartz says about New York City. It's not all the apps' fault, Schwartz says. He attributes some fault for slower speeds in cities to more trucks making daily deliveries for companies like Amazon and others. As numbers are rising, municipalities are grappling with solutions. Encouraging people to use public transportation is one. Another is congestion pricing, which makes people pay to drive on roads they normally drive on for free. This would in effect limit the number of cars on the roads, allowing the remaining vehicles to move faster. "It is not efficient to have a single-occupant car coming into the city, that occupies a tremendous amount of space — very inefficient," Schwartz says. "If we doubled that to two people per car we'd solve the traffic problem in many areas." NPR's Francesca Paris contributed to this report.